We are now offering these excellent Cider kits from New Zealand. We now have in stock: Apple Cider, Pear Cider, Mixed Berry Cider, Strawberry Pear Cider and Blueberry Cider. These kits are designed to make 23 liters. Required Equipment: Primary Fermenter with lid, stirring spoon, hydrometer, Cleaner/Sanitizer, syphon, beer/cider bottles and caps. 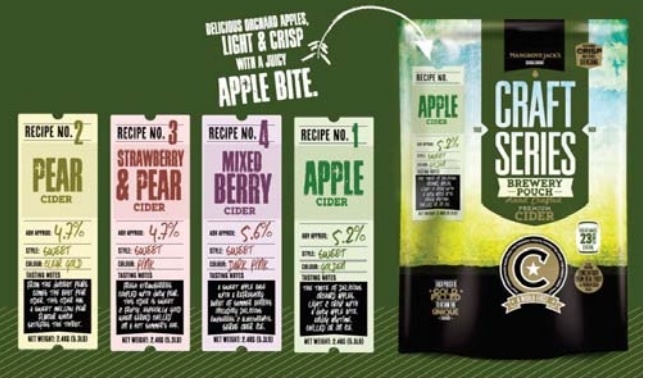 Craft Series Cider kits are cold filled into a pouch, instead of a can. This retains all the delicate flavors and aromas which are lost using traditional canning processes. Click here for our instructions.